A couple of years before my oldest was set to graduate from high school and set off for college, I began putting kitchen and household items away for his future use. Little did I know that he would attend school 3000 miles away from home and would get there by plane. It’s a bit difficult to ship (or travel with) old plates, mismatched saucers, and the chipped Christmas mug from which I envisioned him sipping cocoa, head bent over widespread textbooks, hair shining under a hot-burning lamp. This box of would-be hand-me-downs made it’s way to Maryland with us when we moved. In the flurry of moving day, boxes presented to me every few minutes for appointment to their proper home, I glanced and saw my son’s name on brown masking tape: the downstairs bedroom, I said, already turning my attention to the next box. And so there it sat, placed by movers, unremarkable, unassuming, among all the other boxes. So I was surprised when in the midst of unpacking concert flyers, baseball paraphernalia, and things indicative of college-shenanigans, I found a box of my old dishes, languishing unused in already-yellowed newspaper. Deciding that they would not get the collegiate use I had hoped for, I moved them to our basement kitchenette for easy snacking during family movie night, pool hustling the neighbors, and playing seemingly endless games of Chutes and Ladders. As I unwrapped each dish one-by-one, I was struck by nostalgia. By the memories of friends gathered around my table, eating off plates collected from a variety of sources: Factory 2 U, a storage shed my restaurant-owner landlord forgot about, Goodwill, family hand-me-downs. And I kept telling her: because you never know. You never know when you will decide to host, for years on end, college (and later law school) classmates who can’t make it home for their too-short Thanksgiving break. Or when Easter will call for gathering friends, atheists and Christians alike, to stuff plastic eggs with coins for a little boy in a cowboy hat to hunt for among the devil-heads in your West Texas yard. You never know when someone will knock on your door, and the smell of fried chicken and scalloped potatoes will convince them to stay. 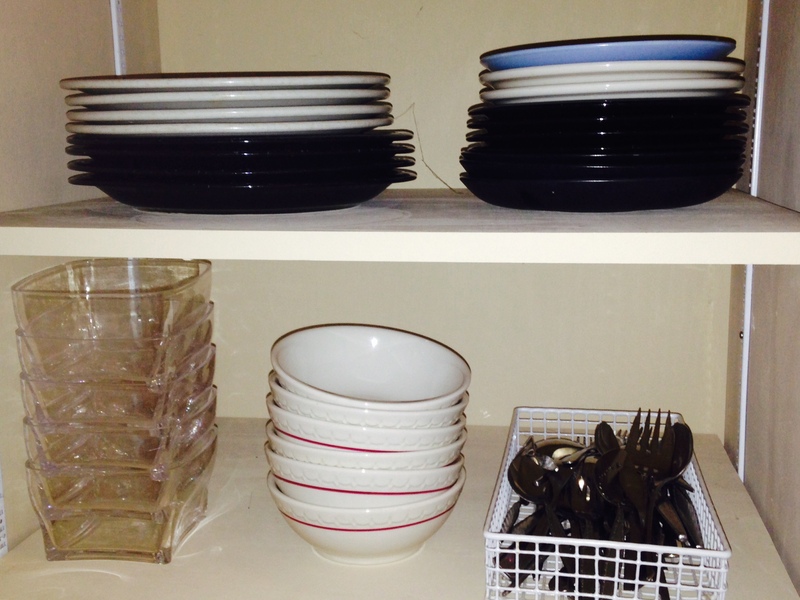 My dishes now are from a wedding registry years’ past. I still have a towering stack of them—I’m too used to hosting not to—but I find these days that half the stack sits sad and surly, and the ten chairs around my dining table (and the eight in my kitchen) get a little too dusty between use. Back in the day I used to fuss: I’d clean, scrub, tidy. Beg Collin to do the same. That’s not different today, yet my fussing goes unnoticed and my plates remain a tower. The other day some men were working in my back yard. It was cold: in the 20s, and with the wind, the mid-teens. “Do you want coffee?” I asked. Oh yes, yes, yes. All three of them would love a cup. Inside my warm house, I brewed a pot. Set mugs on a serving tray along with scalloped spoons, lidded sugar bowl, and a tiny pitcher of milk. I carried the tray to the back and set it on the patio table. As I cleaned up the breakfast dishes, I couldn’t help but see these men through my kitchen window, just moments before working in freezing weather, now leaning against the deck rail enjoying the warmth of ceramic against their hands. One or two of them removed their gloves and picked up the dainty spoons to stir in a bit of sugar, a little milk. They laughed and talked and I rejoiced in their comfort. All that day I wondered: why don’t I serve more? I finally got nice plates to serve from, forks and knives for any number of guests. And yet… more guests arrived when my towering plates were a rainbow of colors, my stemware non-existent, my “good” spoons so weak one once bent in half over a half-gallon of ice cream. More kids, more dogs, more obligations. I’m not busier these days, but the type of “busy” is different. The torture of nap- and bedtime loom large, and most of my work must be done in the wee hours of the morning and the witching hours of night. Things change, time passes, and this week I will host only family. Husband, kids, and Mom, we will enjoy our time together, and I will stress less without the pressure of “guests.” I will also miss those guests, both of recent years and of years past. I will think often of the discard dishes now housed downstairs, waiting patiently for popcorn and potato chips, and wonder if perhaps I should run down when no one is looking and say a quick hello to the memories of having time to spare and friends to spend it with. This week when we share with one another over Thanksgiving dinner what we are thankful for, I will say that I am thankful for our new home, this new place, the looking-forward opportunity to turn towering plates to rubble, to run out of saucers and cups and have to ask someone else to watch the baby while I go fast to the basement to grab a handful of Factory 2 U and landlord-discarded dinnerware. I will be thankful for finding forgotten dishes among a heap of mess and for remembering that hospitality is a dish best served. Hot or cold, messy or pristine, mismatched or Martha Stewart, it simply must be served.